Knowledge of complexity theory and chaos theory is essential for procurement. Technology will become essential in managing complexity in global supply chains. We have to view the definition of “assets” both more broadly and more deeply. Improving RONA is a more balanced scorecard than just cost reduction. Digital transformation is increasingly creeping into a CPO’s crosshairs. Sustainability must be addressed in balance with traditional procurement objectives. Where procurement managers need to focus to stay alive in the 21st century. Why Do CPOs Get Fired? The three key reasons why CPOs and other senior procurement folks lose their jobs. Why Procurement is Like … Probiotics? Your company is like a human body, and your suppliers are microbes. Most are beneficial. Some are not. What is the story of procurement that you want told? 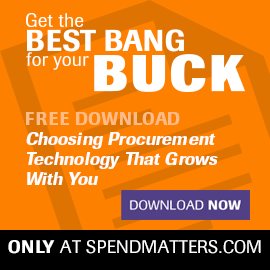 Procurement is fundamentally in the intelligence business.